We have excellent news that the feature vessel line-up for 2017 is already looking good and we may even be scratching our heads to figure out where we will put all of them. Back from her hugely successful circumnavigation is the Australian youth flagship Young Endeavour, always a welcome guest when Navy Week coincides with the Australian Wooden Boat Festival. The ship, under the command of the well-known-in-Hobart Captain Gavin Dawe, has completed a 35,000 nautical mile voyage, visiting 18 countries and changing the lives of 200 young Australians. She’ll be very welcome in Hobart in 2017. The Australian National Maritime Museum, in a much closer partnership with AWBF this time around, will send the ship Bark Endeavour, one of the most remarkable, historically accurate replicas ever built. We loved her last visit to Hobart (albeit a little delayed by weather), when she loosed a broadside of cannon on entry to Sullivans Cove. Thankfully, the charges were blanks, but the effect brought cheers from the crowd awaiting her arrival. 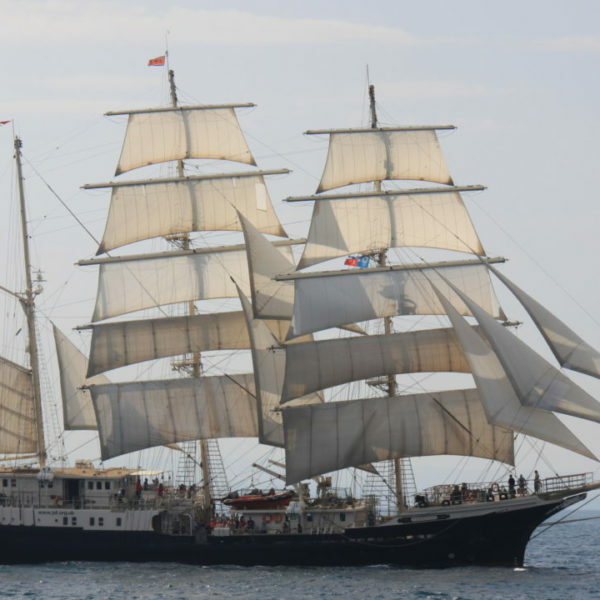 The superb three-masted barque Tenacious will be a dramatic addition to the line-up. At 65 metres (213.25 feet) in length, she is of a similar size to the James Craig and the largest wooden ship launched in Great Britain in the last 100 years. More remarkable still, she is adapted for sailing with people with disabilities, offering a once-in-a-lifetime opportunity for many disabled sailors to crew an ocean-going tall ship in full sail. The ship is operated by the Jubilee Sailing Trust, which sent the Lord Nelson to Hobart for the Tall Ships Festival in 2013. Enterprize is a familiar friend at the AWBF, and now famous for battling the terrifying weather in the Bass Strait and making it to Hobart in 2015, when even the James Craig was unable to complete the voyage. (It’s worth remembering that all ship sailings are subject to wind and weather, of course). With Tasmanian ships Windeward Bound, Rhona H, Julie Burgess, Lady Nelson and Yukon, the 2017 Parade of Sail is shaping up to be one of the most dramatic in recent years. We’ll keep you posted as we add more ships to the roster and confirm notable historic yachts and overseas guests. 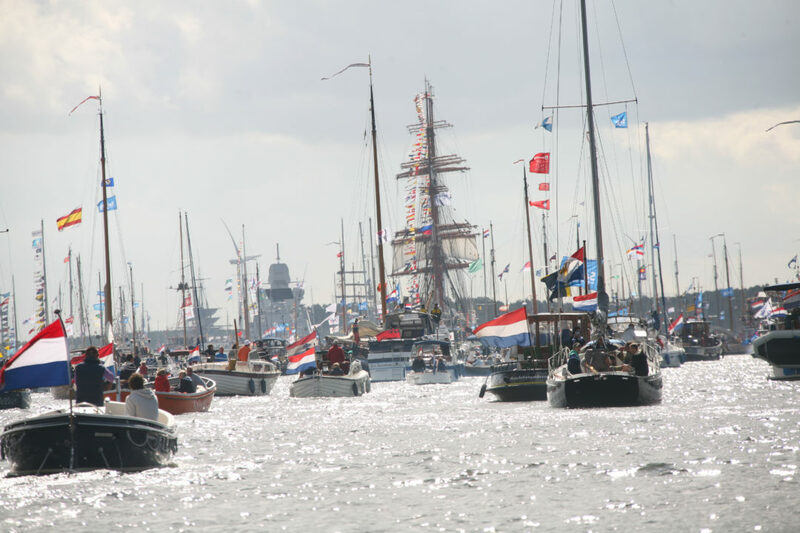 On Wednesday 19 August 2015, 600 tall ships made their way up the Port of Amsterdam and, for the next four days, provided the backdrop for the world’s largest maritime event, Sail Amsterdam. The organisers estimated that 2.3 million people took the opportunity to enjoy this spectacle this year. Sail Amsterdam is held every five years and is so big it occupies five sites around the city of Amsterdam. Each site would take at least a day for a visitor to fully appreciate the vessels on display. By coincidence, my partner Elsje and I had planned a holiday in Europe over July / August and a quick rearrangement of plans meant that we could be in Amsterdam for this event. We were fortunate to secure a berth on an old Rhine River cargo freighter, the Terra Nova which was moored alongside right in the heart of the festivities. This ship was once the pride of the fleet of dozens of similar small Dutch freighters that serviced the trade between Germany, Belgium, France and Holland pre-World War II. In fact the Terra Nova was called the ‘Pearl of the Rhine’ by boating enthusiasts at the time. Terra Nova has been lovingly restored with magnificent woodwork on her uppers and, although a steel hull lay beneath us, her immaculate woodwork was enough to impress this old wooden boat lover. She was from an era in which propulsion from both sail and diesel was being introduced, with both now restored to fine working order. An unexpected bonus of being an honorary member of the Terra Nova crew was that Elsje and I were invited on an exclusive tour of Amsterdam’s canals aboard a canal barge with several other Sail Amsterdam participants. This was so much more than the quick buzz-around you get for 25 Euros using the tourist barges. We went into canals that are still used for freight services; others that are used to ferry goods and equipment for canal-side building projects and still others that are now used exclusively for house boats with permanent residents. The barge then continued into the harbour where, with thousands of others, we enjoyed the Sail Amsterdam welcoming night fireworks. All sizes and shapes of boats, ships, barges and canoes filled the harbour for this spectacle. With little exaggeration, I could have walked back to land using these craft as a foot-bridge. The jostle back into port after the fireworks was described by Elsje as being akin to a ‘Dodgem Car Derby’! Maybe as we consider the theme for AWBF 2017 we should be aware of the familiarity and confidence with which the Dutch approach their sea-going. While I was concerned by factors such as boat-overloading and copious drinking by some of those out in the harbour to view the fireworks, it did not seem to bother these enthusiasts who were hell-bent on simply enjoying the event. I was also amazed at the gunwale-to-gunwale jostling that I have never experienced in Australia – not even at the start of the Sydney to Hobart. But for all my concerns there were no serious incidents – apart from a twelve-year-old boy having to be fished out of the harbour, sodden but OK.
Saturday saw us in Sail Amsterdam’s Zone Orange, one of the five ‘zones’, where many of the featured tall ships were berthed. These included the Stad Amsterdam (Netherlands); Alexander von Humsboldt II (Germany); NRP Sagres III (Portugal); ARC Gloria (Columbia) and Esmeralda (Chile). In the next zone were two ships well-known to Australian enthusiasts – the Europa, which visited down-under in 2014 for the Royal Australian Navy’s 100th anniversary Fleet Review (and our own Tall Ships Hobart event) and Australia’s Young Endeavour under the command of Tasmanian-born CMDR Gavin Dawe. As wonderful as it was to see these ships, the experience was not very pleasant. Walking at a ‘snail’s pace’, shoulder-to-shoulder, about thirty abreast across the width of the wharf, it took Elsje and I almost four hours to walk the length of the main wharf in this zone. Should we have wanted to board one of the ships, a conservative wait-time of a couple of hours each could be added. Given the huge crowd, there was absolutely no room for complementary dock-side activities or entertainment that is a feature of our own Australian Wooden Boat Festival. There was one piano accordion-playing busker on a street approaching Zone Orange and some children’s entertainment in a park adjacent to another zone. That was all I saw! So what are the lessons learned? Firstly, bigger is not necessarily better. 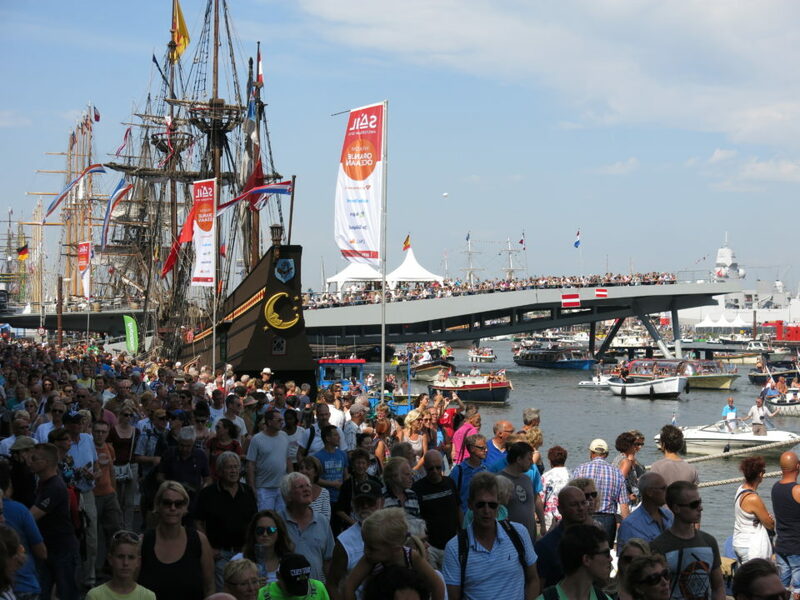 Our 220,000 visitors over the four-day AWBF may be just 10 per cent of Sail Amsterdam’s attendance but it is significantly more comfortable! There is no crush and no excessive waiting times. We also are able to provide the complementary activities such as the shipwrights’ village, the maritime marketplace and some great entertainment for all the family. And concentrating our event in one site with easy access to all the participating vessels and activities is a definite bonus. Try and organise to see most of the event from the water. Despite the surrounding waterways accommodating a constant stream of vessels, it would be a much more pleasant experience to admire the hundreds of beautiful participating ships from a boat rather than from within the throng.